For the chemical elements in the table of elements click here. For the elements and elemental energy types listed in the book, look at this charted table. 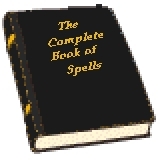 Spellsguide PDF file that's also here on mediafire. The Extended Spellbook with the Periodic Table is here with use of Acrobat reader. I updated the PDFs on 10/22/2018.